Sustainability, the word has been used so often that some have been looking for alternatives for quite some time. But fortunately, the sustainability perspective often still inspires people; like in education, in view of the many courses, tracks, masters and prizes on this subject. 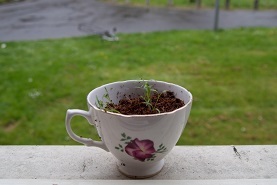 This picture of a teacup by Jeroen Nagel and Jeroen Bosman was the winner of a recent What does Sustainabiloity Mean for You photo contest by Green Office Utrecht. Today is Sustainability Day in Dutch higher education. Today the new sustainable ranking order of universities and institutes of higher education will be published. Universities are listed on their sustainable performance by students on a number of parameters: education, research and housekeeping. The prize is an initiative of Students for Tomorrow network that is active in the realm of sustainability. The network is linked to initiatives like the Green Office Movement of rootAbility and is a member of DuurzaamDoor, a knowledge program that is a fine example of the green polder, as official bodies, entrepreneurs, education and research institutes and NGOs all participate in it. Central to this organisation are social and political issues: energy, water, biodiversity, resources and world food supply. These are the main themes of our times. They will also play a central role in the prize winner’s actions. But on reading through the way DuurzaamDoor frames these issues, one cannot help to notice that the ongoing technological revolution is of minor importance to them. Have we got used so much to framing these issues in purely social and political terms, to be solved by changes in mentality and in power structures, and not to pay attention to their technological aspects? It is exactly the other way round, compared to the seventies: then technology was relatively helpless in matters of sustainability, but everyone (surely governments too) held technological solutions in high esteem. Now technology is making giant strides in sustainability each year but that draws little attention, outside the circles that are directly involved. Our book Green Growth offers many examples of technological solutions for sustainability problems. In all five themes (with the possible exception of biodiversity), technology will provide the key to improvement. Its results are apparent today already. The best Dutch horticultural companies now need no more than 4 litres of water for the production of 1 kg of tomatoes, as opposed to 22 litres in traditional greenhouses. For comparison: in Spain 27-40 litres per kg of tomatoes, and in Israel 60 litres. This is sustainable technology at work! Then technology’s contribution to the solution of the global food problem. In the Netherlands, one hectare may yield as much as 50 tons of potatoes; yields in Russia and China are around 15 tons. Whereas the use of fertiliser and pesticides is falling. In energy technology, same story. Solar technology has made great advances – the price of the solar kWh is just 6% of that thirty years ago, and that development still goes on. In our book Green Growth (in Dutch) we give many similar wonderful examples. And elaborate the policies and social changes that could turn them into a success. If one would lay crosslinks across these five themes of energy, water, biodiversity, resources and food, would not sustainable technology’s achievements and prospects come even more to the forefront? Notably those of green chemistry. Green chemistry increasingly enables us to imitate nature’s processes; making use of that, future industries will look completely different from those today. Without the use of toxic solvents and intermediates, with much less waste, with lower use of resources, of a non-fossil nature and a much lower footprint. In one word: sustainability. That would be an outstanding development to participate in!